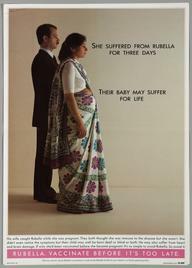 1983 - National Rubella Council (NRC) is formed. Patron is the Princess of Wales; 11 voluntary organisations, the Institute of Child Health and the Health Education Authority. 1991 - NRC is reformed as the National Council for Child Health (NCCH) with a major campaign called Child 2000. The emphasis for the work of the Council was schoolgirl immunisation.